American Exceptionalism: Neither Joseph Stalin nor Alexis de Tocqueville coined the phrase that is now patriotic shorthand. 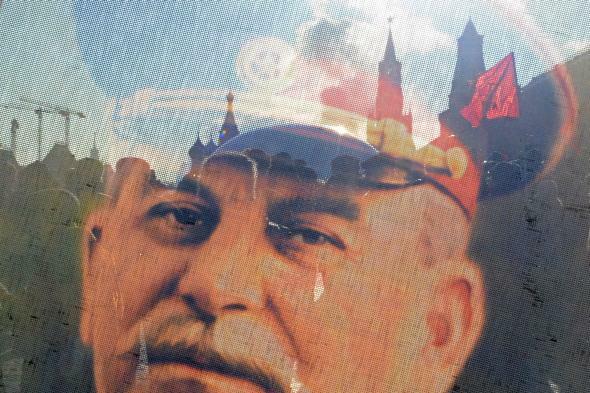 Did Stalin Really Coin “American Exceptionalism”? Russian Communists and their supporters are seen through a transparent portrait of Soviet dictator Josef Stalin as they lay flowers at his tomb at the Red Square in Moscow on March 5, 2013, to mark the 60th anniversary of Stalin’s death. Putin’s comments revived an old discussion about the origins of the phrase. On Talking Points Memo, Josh Marshall addressed an article by Terrence McCoy—”How Joseph Stalin Invented ‘American Exceptionalism’”—that appeared last year on the Atlantic’s website. And on Real Clear Politics, Robert Samuelson wrote that “the most interesting fact to surface in the ensuing debate over “American exceptionalism” is that the phrase was first coined by Putin’s long-ago predecessor, Joseph Stalin.” But should Stalin really get the credit? First off, it’s important to note that “American exceptionalism” has moved through a few different historical waves (as linguist Mark Liberman observed last year in his piece, “The third life of American Exceptionalism“). The first wave was in the ‘20s and ‘30s, when American socialists argued over whether the United States was immune to what Marx thought was an inevitable move of capitalist societies toward communism by means of violent struggle. The second wave (the focus of Josh Marshall’s TPM post) came after World War II, when historians like Richard Hofstadter reframed the question of “American exceptionalism” in a more positive manner, as a way to explain how the U.S. had avoided the bloody conflicts experienced by Europe in the 20th century. Most recently, as when “exceptionalism” became a buzzword among Republican presidential candidates in the last election, the term takes on highly patriotic overtones, resonating with Ronald Reagan’s image of the U.S. as “a shining city on a hill.” Republicans have faulted Obama for lacking faith in American exceptionalism, which may have encouraged his “exceptional” rhetoric in his address to the nation on Syria. That might play well for a domestic audience, but to Putin it sounded jingoistic. In 1929, Communist leader Jay Lovestone informed Stalin in Moscow that the American proletariat wasn’t interested in revolution. Stalin responded by demanding that he end this “heresy of American exceptionalism.” And just like that, this expression was born. What Lovestone meant, and how Stalin understood it, however, isn’t how Gingrich and Romney (or even Obama) frame it. Neither Lovestone nor Stalin felt that the United States was superior to other nations—actually, the opposite. Stalin “ridiculed” America for its abnormalities, which he cast under the banner of “exceptionalism,” Daniel Rodgers, a professor of history at Princeton, said in an interview. If Stalin did indeed tell Lovestone (presumably through an interpreter) to end the “heresy of American exceptionalism” when they met in the spring of 1929, Stalin would have been throwing the phrase back at him rather than coining it anew, since Lovestone’s position on the matter had already been reported in the Communist press. Of course, that doesn’t make for as good a story. Then again, as long as Americans are feeling so patriotic in this latest wave of “exceptionalism,” why shouldn’t Americans get credit for coining the expression, rather than a French writer like de Tocqueville or a Soviet leader like Stalin? It is unfortunate for the United States that it has by turns affronted nearly every Government in Europe, and left to itself only the natural sympathies of the peoples for those who appear before them as the friends of liberty. There is one thing to be said about civil wars — they do not last long. It is probable that the “exceptionalism,” if one may use the word, on which the Americans rather pride themselves, will not prevail in the case of the struggle between North and South.